That ... that was the only thing he could remember about his life. He didn't understand how this could be possible. His mind functioned without flaw, trying to calculate his surroundings and predicament. Knowledge flooded his thoughts, facts and images, memories and details of the world and how it works. He pictured snow on trees, running down a leafstrewn road, eating a hamburger, the moon casting a pale glow on a grassy meadow, swimming in a lake, a busy city square with hundreds of people bustling about their business. "Someone ... help ... me!" he screamed; each word ripped his throat raw. A loud clank rang out above him and he sucked in a startled breath as he looked up. A straight line of light appeared across the ceiling of the room, and Thomas watched as it expanded. A heavy grating sound revealed double sliding doors being forced open. After so long in darkness, the light stabbed his eyes; he looked away, covering his face with both hands. He heard noises above--voices--and fear squeezed his chest. Thomas was hit with a wave of confusion, blistered with panic. The voices were odd, tinged with echo; some of the words were completely foreign--others felt familiar. He willed his eyes to adjust as he squinted toward the light and those speaking. At first he could see only shifting shadows, but they soon turned into the shapes of bodies--people bending over the hole in the ceiling, looking down at him, pointing. And then, as if the lens of a camera had sharpened its focus, the faces cleared. They were boys, all of them--some young, some older. Thomas didn't know what he'd expected, but seeing those faces puzzled him. They were just teenagers. Kids. Some of his fear melted away, but not enough to calm his racing heart. 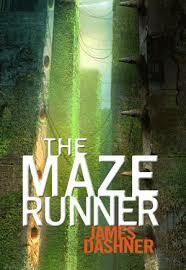 One of the best works of Dashner, The Maze Runner has inspired two celebrated Movies.Story is staged in a glade, run by two boys. New members keep entering the glade as the story unfolds. The philosophy to be followed is pretty simple, yet horrifying: Remember. Survive. Run!